All natural bamboo handled toothbrushes for your large and small pets! WooBamboo`s large breed and small breed pet brushes are similar to their human brushes, but with some ergonomic and bristle changes, making brushing your companion easier. Every year billions of plastic toothbrushes are thrown away, clogging landfills and polluting the oceans. Woobamboo toothbrushes offer a natural and biodegradable option that works just as well and last just as long as a conventional toothbrush. The handle is made from sustainable and organic moso bamboo which is panda friendly (not the bamboo that they eat). The recyclable bristles are Dupont Tynex, arguably the best quality and most trusted bristle available. So when you`re done using your WooBamboo toothbrush, you could literally pull out and recycle the bristles, and throw the handle into your compost where it will gently biodegrade. They`re "Vet approved, Mother Nature recommended!" 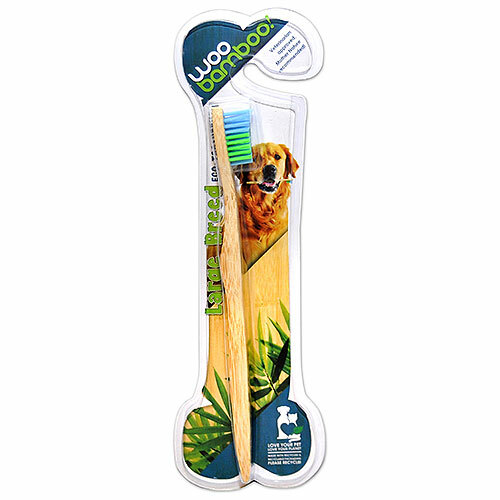 The WooBamboo Pet toothbrushes have a strong pet safe handle and are coated with a natural non-toxic wax. Below are reviews of WooBamboo Large Breed Pet Toothbrush by bodykind customers. If you have tried this product we'd love to hear what you think so please leave a review.